Whether you're at the office or at home, making sure you get some alone time is an important part of emotional well-being and maintaining balance in your life. 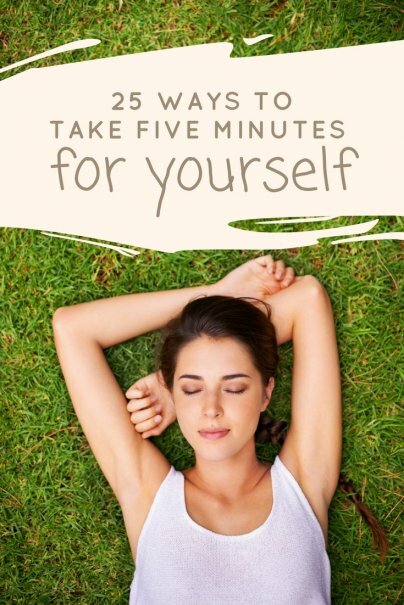 Here are some suggestions for ways to ensure that you get at least five minutes focusing on yourself. While some of these are purely for fun, others are more practical ways to snag some time to yourself and accomplish those little tasks you've been putting off. Take a five minute break from your computer and walk around the building, or just go outside to get some fresh air. If you work at a computer all day, it is important to take regular breaks from the screen. Screen breaks not only help save your eyesight and prevent headaches, but they can also promote productivity. For more reasons to take five and go for a walk, check out Paul's article on the benefits of walking. Whether you're an herbal tea drinker or a green tea fan, taking time to slow brew a cup of tea is a great way to get an extra five minutes of quiet solitude. Five minutes is a good average seeping time for most types of tea. In the winter, take the prevention route by brewing echinacea or ginger tea. Normally I'm one of those people who cannot clear my head when I meditate, but recently a friend and meditation guru introduced me to a method that really worked for me. Pick a phrase or mantra that is meaningful to you. Set a timer, close your eyes, and repeat the words silently in your head for five minutes. If you can't think of a phrase, try repeating something that you are thankful for. Speaking of being thankful, writing a thank you note to someone is a great way to show your gratitude and sharpen your letter-writing skills at the same time, and it doesn't have to be something specific. It's a small gesture, but a simple thank you goes a long way. Five minutes may not be enough time to write down all the things you'd like to do in your life, but you can at least get your bucket list started. Set a timer and just start writing. Don't worry about making your list extravagant. Taking five to dream about the places you'd like to travel or goals you want to set for yourself can also be a good way to look back on everything you've accomplished. Even if you don't consider yourself a creative person, you'd be surprised at how relaxing it is to make a simple flower arrangement or centerpiece for your dining room or kitchen table. You don't even need flowers for a centerpiece. Pine cones, fruit, or any materials you find around the house or in your yard can also work. Reading has lost much of its allure now that there's a wealth of television and film that can be watched instantly online. Taking five minutes to read an article or blog post about one of your interests is one way to sharpen reading skills and engage with the world around you while taking a few moments of solitude. There are plenty of stretches you can do to help maintain flexibility and prevent sore muscles, even if you only take five minutes to stand up and stretch at the office. Check out Meg's article, 10 Exercises to Do at Work That Don't Make You Look Silly, for more ideas on ways to get exercise during short breaks at work. This is a great one for parents. Instead of calling a time out for the kids, call an official time out for yourself. Take a few moments and let someone else watch the kids while you go to your room to meditate, stretch, or just sit in silence. No matter where you take your time out, try to find somewhere quiet. Give your feet a rest with a five-minute foot soak in the tub or a water basin. Soaking in bath salts is an excellent way to take some time to yourself, relax, and ease tired feet. You don't need to buy expensive salts. A cup of Epsom salt will work fine, or for added relaxation and aromatherapy, you can sprinkle in dried herbs such as lavender or chamomile. Taking the dog for a quick walk by yourself is another way to get away from the family or coworkers for five minutes. If you work in a dog-friendly office, let your coworkers take turns with walking your dog; it's a great way to give your dog some extra exercise and promote a healthy work environment. Like stretching, doing a few simple breathing exercises or taking a few long, deep breaths can help ease tension and give you some down time. For more ideas, read Sasha's breathing tip in her article, Super Solid Yoga Tricks to Help You Relax. While this may not be the most relaxing way to spend five minutes for yourself, it is a practical way to get some alone time and initiate a more financially responsible lifestyle. If you aren't sure how to get started, look at David's post, 8 Tips for Improving or Starting a Budget. You may not be able to plan all the details of your next vacation or weekend getaway in five minutes, but you can definitely get started. Like the bucket list, just start writing down your ideas. With social media and all the communication technology available today, some people rarely make a phone call to catch up with an old friend. Of course, it may turn into more than five minutes, but it's a way to connect with an old friend with more than just posting something on a Facebook wall. If you're a regular Wise Bread reader, you are probably a frugal shopper. Take five minutes to compare prices and find great deals on an item on your shopping list. Ever wanted to start a blog but didn't think you had the time? Now's your chance. It takes about five minutes to set up a basic account for a blog. I find that WordPress is one of the more user-friendly blog sites, and you can always go back and change your design or add photos and a bio. Why not get started now? Like walking, riding a bike is a great way to get exercise and time for yourself. Cycling is also ideal for people who have knee or lower back problems. This one may not be for everyone, but I love building fires whenever I visit friends who own a wood-burning stove or fireplace. Getting up early to start the first fire gives you some time to yourself before everyone else wakes up, and it's also practical. If you don't own a fireplace, you can always get up early to start that first pot of coffee. This one is purely for indulgence. I don't know if all the claims about the benefits of dark chocolate are true, but antioxidants or not, I can't think of anyone who doesn't love sitting down and enjoying a piece of chocolate. Hydration is important whether you are at work, home, or school. Most people don't realize that they aren't drinking enough water. The standard goal is to aim for 64 ounces of water a day. Take five minutes to make sure you get in another eight ounces today. I'm a firm believer that breakfast is the most important meal of the day. Make something you've never tried before or that you normally wouldn't eat because you don't have time. You can make eggs and toast in about five minutes. On a recent vacation, I happened to notice a bubble machine in a second-story window of a busy square. Watching the bubbles float down to the ground was so peaceful that I decided to buy some the next time I see them at a store. Indulge the kid inside and get a bottle for yourself. Normally, I don't take the time to paint my toenails, but I find that it can be as relaxing and meditative as painting a picture or room. It's also less time-consuming and a little cheaper. If you just aren't into that kind of thing, get a watercolor kit or stain a piece of furniture. There's a lot to be said for the power nap. I find that when I'm exhausted, even a five-minute nap can be refreshing and provide an excellent opportunity to get some alone time. During a stressful day, five minutes really does do years of good for your emotional well-being. I've found that the best way to spend a five minute break is by incorporating some sort of physical activity, whether it be a quick set of pushups or a good stretch. This will take your mind off of your busy day, and give you a boost of energy to power through your work. Awesome little ideas. When I need some alone time I like to make myself a cup of tea. It is soothing, warm and relaxing. Stretching is also a good idea. It loosens you up and relaxes your muscles so you can calm down and feel at ease. My work is near a park, so on nice days, I'll head "out for lunch" and either eat at a picnic table or walk through the park. It's great to completely get away (I even leave my phone in the office) and take the time to re-charge myself. I think a lot of people set relaxation goals that are far too high - I must go to a spa or I have to get away on vacation. These five minute tips are a perfect way to build relaxation and stress reduction into our day to day life.